Pen and ink drawing of a view of Madurai from the east with the Minakshi temple and palace, by George Waight, c. 1783. Inscribed: 'A view of Madura, from ye Garden House at Tipocolum. Trees too conspicuous'. Tirumala Nayaka (r. 1623-59) was one of the most important rulers of the Nayaka dynasty and was an ambitious builder; the Minakshi Sundareshvara Temple complex which dominates the centre of the town dates to his reign. The temple is contained within an enclosure of high walls entered through tall pyramidal gopuras (gateways). Within the enclosure there are colonnades, columned mandapas, tanks, shrines and two temples dedicated to Shiva as Sundareshvara and his consort Minakshi. The Tirumala Nayaka Palace was built in 1636 and was intended to be one of the grandest palaces in South India. Yet shortly after the palace was completed in 1659, Tirumalai's grandson Chokkanatha took the Nayaka throne and transferred the capital to Tiruchirapalli, dismantling large parts of this palace. 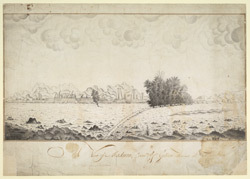 This drawing was probably made after Colonel William Fullarton gained control of Madurai in 1783. Waight, the artist, served in the Madras European Infantry and a detachment of the regiment was positioned with Fullarton during the campaign.